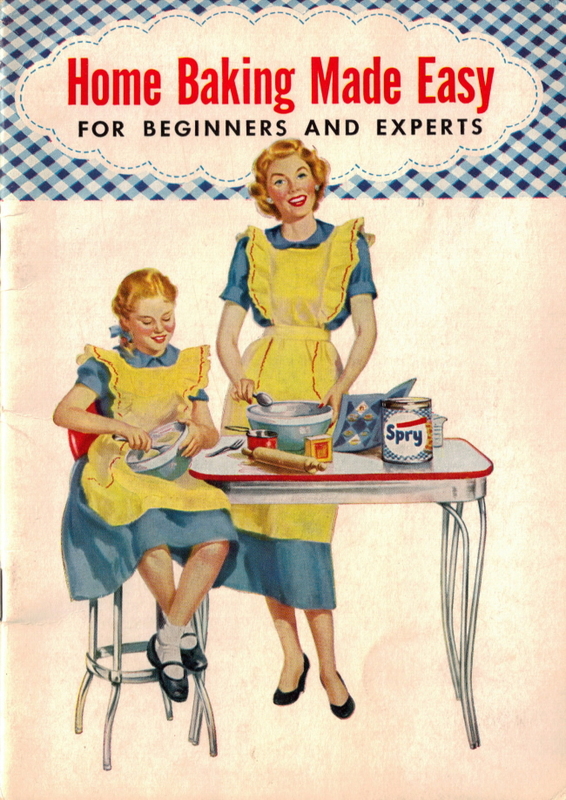 Here is the second part of page 3 of the vintage cookbook: Home Baking Made Easy that was published in 1953 by Lever Brothers Company. *You can view the scan on the previous page: How To Measure Ingredients. Eggs: Keep eggs in the refrigerator and take out only the number needed when baking. Remove eggs from the refrigerator about 45 minutes before using. Eggs beat up to larger volume when brought to room temperature. Milk: Homogenized milk or milk that is not homogenized can be used in Spry recipes, and in many cases skim milk is satisfactory. Canned unsweetened evaporated milk is usually mixed with an equal amount of water. Buttermilk or Sour Milk: Use interchangeably. Should be fresh and thick. Cream: Heavy for whipping. Light cream is often used for cooked sauces and frostings. Granulated Sugar: Cane sugar or beet sugar can be used interchangeably. Sift if lumpy. Powdered Sugar: A little coarser than confectioners’ sugar. Sift before using. Confectioners’ Sugar: The finest sugar obtainable. Sift to remove even the tiniest lumps. Brown Sugar: Light brown sugar has a delicate flavor and is most generally used. Dark brown sugar contains more molasses and has fuller flavor. Either can be used unless otherwise specified. Store in tightly covered container. To prevent lumping, keep a piece of bread with the stored sugar. Butter or Margarine: In Spry recipes, butter and a high-quality margarine like Good Luck Table Margarine can be used interchangeably. Baking Powder: In Spry recipes, any type of baking powder can be used in the amount given unless otherwise indicated. In “One-Bowl” cakes smaller amounts are required for double acting baking powders like Calumet, Davis, KC, Clabber Girl, than for tartrate baking powders like Royal. Chocolate: In general, unsweetened baking chocolate is used unless otherwise indicated. Spices: They should be bought in small quantities in order not to lose their full aroma before used. Keep covered. Raisins: Seedless are the small dark or light ones. Seeded raisins are the large seeded ones from which the seeds have been removed. All-purpose Flour: Also referred to as enriched flour or family flour. It comes in bags. Made from a blend of soft and hard wheat flours. Good for general use . . . ideal for piecrust, breads, cookies. Store in cool, dry place. Cake Flour: Especially milled from soft winter wheats for making the finest, most delicate cakes. Comes in cartons. Store in cool, dry place. Do not use self-rising cake flour in Spry recipes. Homogenized Spry: Use Spry as it comes from the can. Do not refrigerate–keeps fresh at room temperature. Nuts: Keep nuts in airtight containers in a dark place and preferably in the refrigerator. Do not slice or chop nuts until they are to be used.